It looks like Maxis iPad mini and the fourth generation iPad bundle price are out, ahead of the official announcement. 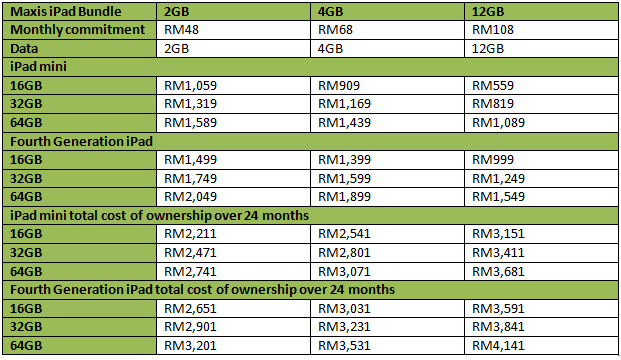 If you think the non-contracted DiGi iPad bundles are expensive because it provides no subsidy, Maxis’ plans can get you an iPad mini from as low as RM559 and the latest iPad from RM999, with data plans ranging from 2GB to a whopping 12GB. Do take note that these bundles are for Wi-Fi + Cellular iPad. They are available for purchase only at KLCC Maxis Center and ties you up to a 24 months contract. The plans are not up yet on Maxis’ website but we’ll update you once it is. So Celcom, it’s your turn.